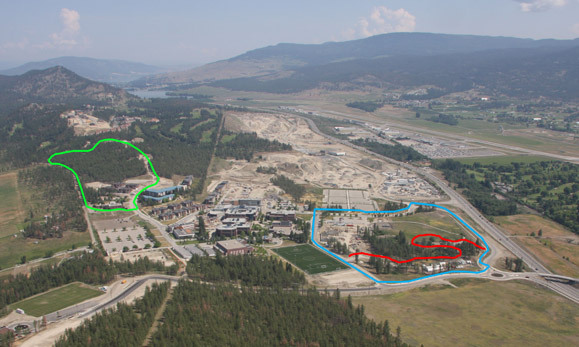 This aerial photo looking north over UBC Okanagan’s campus shows the location of the new trails. (Pine Trail in green, Snowberry Loop in blue, and the Old Pond Trail in red). A new Campus Trails System was officially opened today at UBC Okanagan. The trails greatly expand campus green space, and were created for students, faculty and staff as a way to engage the campus community, protect the natural environment, and promote healthy and sustainable campus life, says Doug Owram, UBC Okanagan Deputy Vice Chancellor. "The trails system initiative is just one example of UBC Okanagan's commitment to healthy and sustainable communities," says Owram. "We strongly believe in fostering positive relationships amongst our internal and external communities, and we know great things can happen when people have the opportunity to come together in healthy ways. "UBC Okanagan is proud to be a leader in sustainability, and is committed to using innovative solutions aimed at building a vibrant and connected healthy community." The UBC Okanagan Campus Trails System consists of three different walking paths. The Pine Trail, which connects to the Quail Ridge community trail and takes about 20 minutes to walk, is a slightly more rugged trail situated in the forest that surrounds the university. The Old Pond Trail, an educational, interactive and relaxing trail that takes walkers past the campus pond and the Learning Garden. "The Campus Trails project has been very much a campus community and volunteer-driven initiative supported by a number of partners, including the Trails Action Group, which has kept the project moving forward amidst many challenges," says Claire Budgen, Director of Health and Wellness at UBC Okanagan. "Individuals from the campus community made this project a reality because of their own passion and interest. "It was their vision to bring faculty, staff and students together to use their diverse knowledge and skills to protect and restore the campus natural environment in the midst of extensive and rapid growth. Having a vision is the foundation of the process, but implementing that vision is the real challenge. This project shows UBC Okanagan is up to the challenge of creating a sustainable planet by engaging in the process here, on the land of this campus." Fourth-year Bachelor of Arts student Ben Glassco, who represented the UBC Students' Union Okanagan (UBCSUO) on the Trails Action Group, says students will benefit from the trails system as it provides better access to campus for those who walk to school from Quail Ridge, as well as important green space. "The green space surrounding UBC Okanagan is a blessing that not all schools are lucky enough to have," says Glassco. "This is especially important as a significant demographic of UBC Okanagan's students are from out of province and come to study in B.C. specifically for its natural attractions." The Campus Trails System is the result of more than three years of planning. It was funded by the offices of the Associate Vice President Students, Associate Vice President Finance and Admin, the VOICE Study at UBC Okanagan, the Focus on People Healthy Workplace Initiatives program, and the Interior Health Authority.